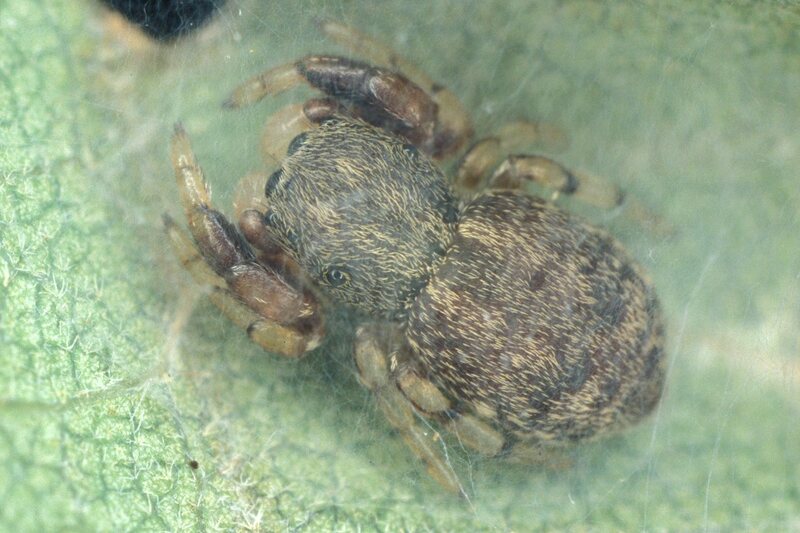 Description: Small, compact spider with pale legs and characteristic leg annulations. The body is dark reddish-brown, rather thickly covered with pale yellow-brown hairs. There is a faint dark midline band on the abdomen with two likewise faint and dark transverse bands.Legs pale except for femora, patella and tibia og legs 1, which are partly or wholly darkened. The pale legs are furnished with some narrow, dark annulations which are very noticable in the field. The leg segments do not differ much in length. The male has legs I stouter than the rest. Size: Female 4.5-5 mm; male 3-4 mm. Genus: Ballus C. L. Koch, 1850. Characters of genus: The carapace is rather flat with the highest point is just behind the eyes. The width of the posterior row of eyes is about 1.25 times the width of the anterior row. 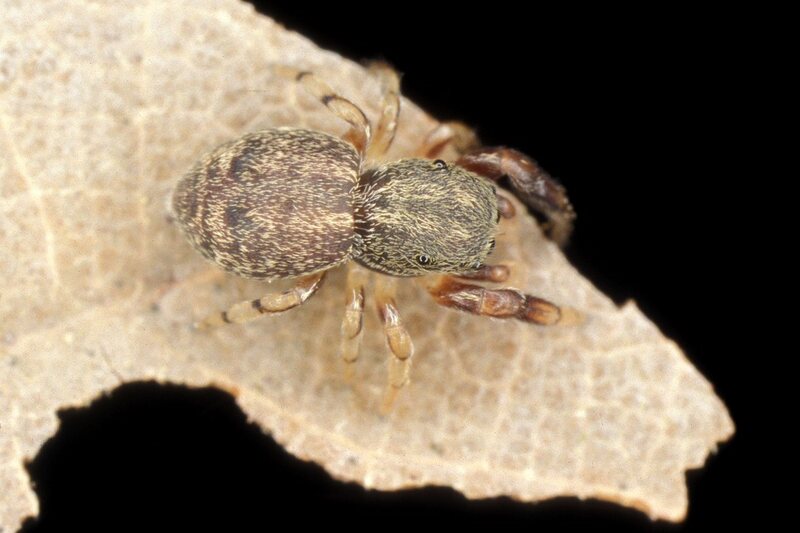 Family: Salticidae Blackwall, 1841 (Jumping spiders). Characters of family: Small to medium-sized, shortlegged spiders easily recognizable by the characteristic eyes arranged in three rows. The anterior row of eyes is situated on a more or less vertical face, the medians being very large, the laterals somewhat smaller and set higher on the head. The second row of eyes consists of two very small, often minute or vestigial eyes set further back on the head. The two eyes of the posterior row are about the same size as the anterior laterals, and are set about halfway back on the carapace at the edges of the head. The anterior medians are highly sophisticated providing acute vision used to leap accurately while moving around as well as capturing prey and escape efforts.